Today is the last day of my Pinterest inspiration outfits. I'm kind of sad to see it go because I've really enjoyed finding new ways to wear my clothes. Sometimes it can be tough to find interesting ways to wear items you've had in your closet for what seems like forever. I'm drawn to this outfit because it looks so chic. I love the feminine lace and the red lips. Jeans are always OK in my book. This is pretty much the definition of 'Classic Pretty' if you ask me. Here's my take on the look. I don't have a lace tee, but I think my lace tank does the trick. I've had these jeans for over 4 years, and I love them. 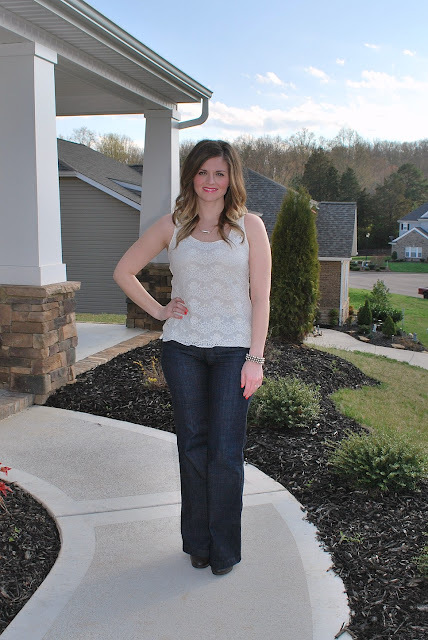 I don't really care that flare leg jeans aren't the thing right now. They make me feel taller and thinner. I went with a bright pink lipstick instead of red. Don't get me wrong, I love me some red lips, but I'm not ballsy enough to make it work. I also chose to wear my hair down just because I like it better that way! Overall, this is a simple outfit, but I'm a simple kind of girl. What do you think? Super cute pics!! You look adorable! 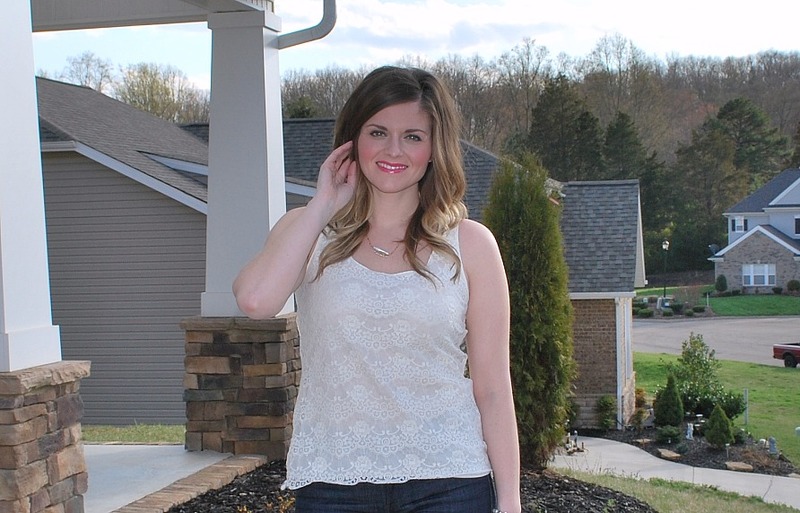 Love that top, white + lace = classic, chic! Beautiful outfit! It's perfect for spring! 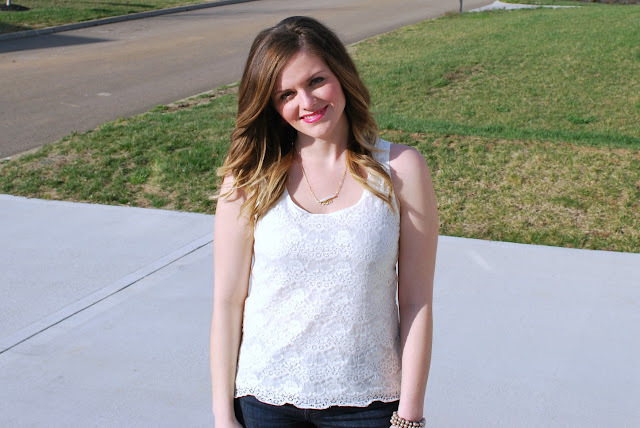 Loving your lace top and lip color! Love your outfit. What a great idea. I did a 30 in 30 challenge and I was amazed at all the new outfits i created from just 30 pieces from my closet. Visiting from the link up. Would love it if you stopped by and said hello on my blog. That's why it's inspiration. You take something then make it work for YOU. This totally works. Plus, flare jeans are having a moment right now. I saw them on street peeps during NYFW. You look very pretty. I'd wear this in a heartbeat! Sometimes simple outfits are the best ones! I love this - that top is gorgeous!! Love this. 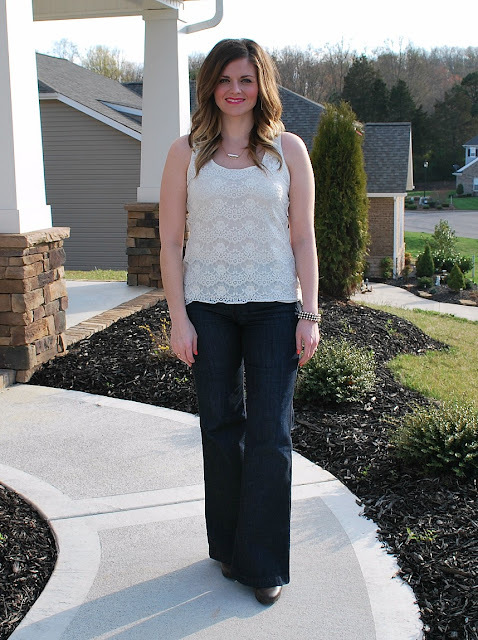 Those jeans fit you so well, and the lacy top is just so pretty.